How to Layer Up for a Stylish and Warm Winter! Visualize this: A cold winter night, sitting by a bonfire sipping on some hot coffee or brandy, or a cosy evening spent on a warm couch reading a book, small clouds of mist emanating from your mouth when you speak, or the irresistible smell of a sizzling barbecue. Now also visualize the winter wardrobe of your dreams: Uber stylish faux fur jackets, snuggly fleece jumpers, warm woollen scarves, Burberry trench coats, knee high boots, cutesy gloves, socks and the works. Reality check: You live in a city that gets about 5 degrees cooler than summer during this so-called ‘winter’. Or you live in northern India where your style quotient drops along with the temperature. You've gone from sleek summery jumpsuits to bulky, shapeless sweaters that add about 5 kilos to your frame. But that fashion magazine-style winter of your dreams is a possibility. With the help of our shopping guide, of course - one in which we've put together the best winter wear on offer this season. Read on to assemble your very own wardrobe of stylish winter wear. Yes, Christmas has come early this year. Ho ho ho! 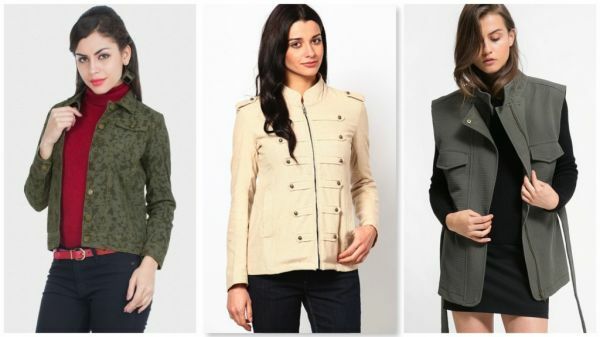 Think of a swanky army girl and nod to military-inspired fashion this winter. Dress in jackets featuring multiple zippers, lapels and OTT gold buttons. Khakis and military prints rock too. While green is the commanding colour of this battalion, you can experiment with beige, tan and similar hues as well. Zovi’s Green Military Print Casual Jacket (Rs. 899) and Mojo Cream Military Jacket (Rs. 3,200) are great options. Mango’s Military Textured Gilet (Rs. 5,590) will earn you some major style stripes. Take a trip back to time and give your winter attire a retro throwback. Think bright colours, loud prints and an abundance of polka dots, topped off with winged liner for a fitting tribute to the ’70s. This Tiara Polka Dot Scarf on Lime Road (Rs. 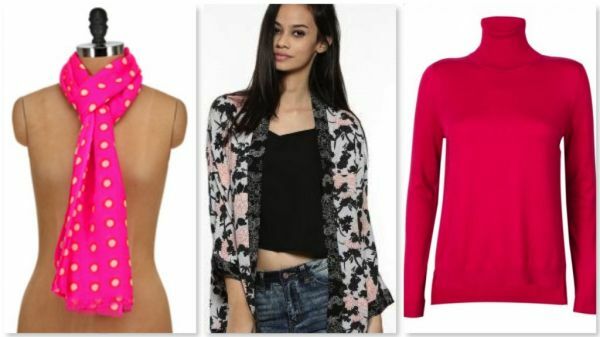 795) will brighten up a boring outfit while Oasis’ Rose Print Kimono on Koovs (Rs. 3,800) will look best with palazzos, beaded jewellery and oversized sunnies. This FCUK Bambino turtleneck sweater (Rs. 4,999) worn with flared pants and cat-eyed spectacles will fit the bill too! Wish to unleash the bad girl in you this winter? Leather (and lots of it) is the answer you are looking for. 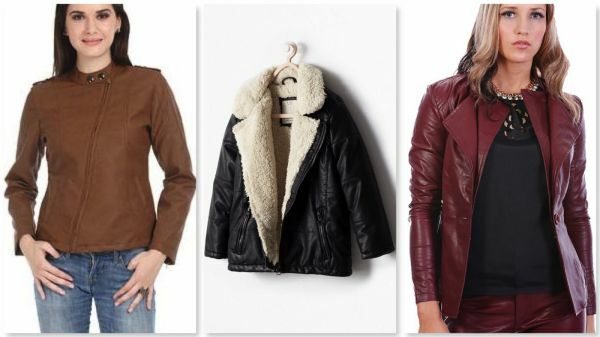 Turn to leather jackets and vests in a plethora of colours for the ultimate biker chic look. Extra points for OTT studded leather outerwear! A tan motorcycle jacket like this Oner Full Sleeve Solid Women's Motorcycle Jacket on Flipkart (Rs. 3,299) is a welcome and chic change from black. If you’re feeling experimental, opt for a jacket in burgundy, undoubtedly the colour of the season. Lioness Pu Leather Partywear Jackets on Snapdeal (Rs. 4,180) is a good bet. If you’re hit by chattering cold weather, this Zara Fleece lined leather effect jacket (Rs. 3,990) should be your go-to. For the ultimate feminine beauty, what can be more fitting than floral? Moody, oversized blooms are a winter favourite too. This MANGO Women Off-White Printed Cardigan on Myntra (Rs. 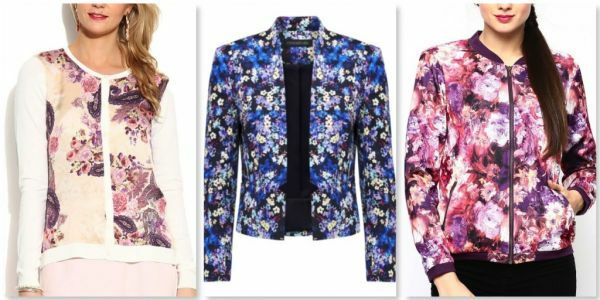 3,990) will help you cut a pretty picture while this Wills Lifestyle Women Purple Floral Print Jacket (Rs. 3,499) is right on-trend. Forever New’s Bessie Printed Blazer (Rs. 5,800) has chic written all over it! Winter is the perfect time to up the ante on your formal work wear quotient and bring out those blazers ! 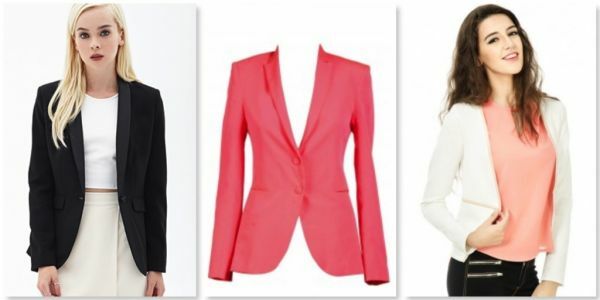 A basic black blazer is a must and this Forever 21 Structured Two-Tone Blazer (Rs. 2,329) promises versatility. Pack in a punch with this Neon Namrata Joshipura blazer on Pernia’s Pop-Up Shop (Rs. 10,500) or go for a monochrome look topped off with a chic white blazer like Stalk Buy Love’s Erin Blazer (Rs. 1,449). * This is a sponsored feature for Shopalike.